View from 450 Sutter, San Francisco, California, United States of America, September 22, 2014. My dentist's office is on the top floor of 450 Sutter St. in SF. It houses hundreds of dentists, oral surgeons and orthodontists. I think Herb Caen dubbed it, "The House of Pain" a few decades ago. Before my teeth were cleaned I snapped this shot. Imagine my surprise watching a cruise missile sail by the window! I waited for the 1,000 pound bomb to find its target of ISIS in America. I've heard retired Gen. Anthony Zinni talk about the need for these bombs to the TV journalists. At 1.5 million bucks a pop, I was pretty confident this smart bomb would hit its mark. I just hope none of the moderate people around them are hurt. As the dental hygienist and I talked about the Simpsons and mountain bike riding, it occurred to me how easily it was to ignore these missiles and bombs hitting us unless we personally see them or are hit by them. I know it's not me the missiles are targeting, it's only targeting bad people in our city. I'm sure you know how it is in your city. You have some bad people in your city you expect to be hit by the American military. It stops terrorists. My teeth were clean, I got my new purple toothbrush and three containers of floss and made my way home among the debris. Just another beautiful day in Baghdad by the Bay. 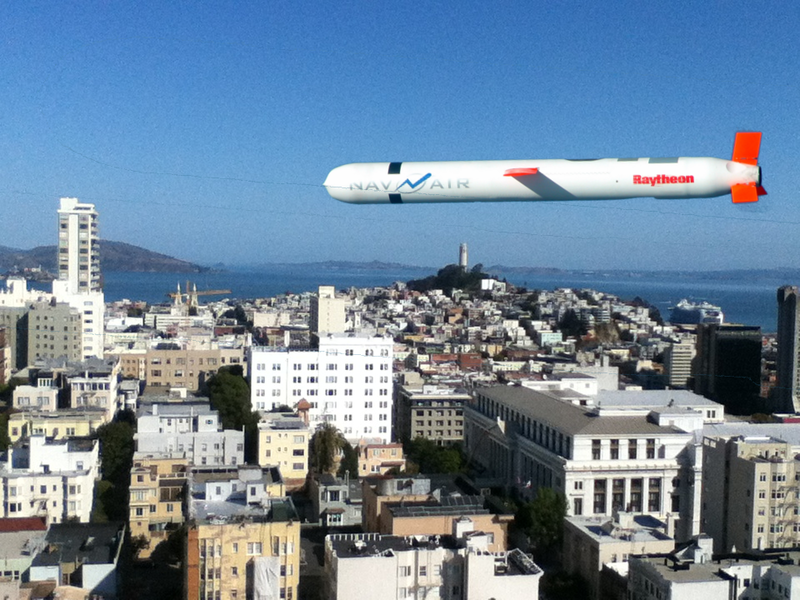 Photo collage by Spocko BTW, since this has been picked up as "news" I want to make it clear this post is not about San Francisco being hit, but to point out being hit by the a cruise missile is an everyday thing in many cities. Imagine it was your city being hit.